Russian President Dmitry Medvedev and U.S. Defense Secretary Robert Gates will discuss the issues of Russian-U.S. military and technical cooperation, including those related to missile defense, during their meeting in Moscow on March 22, the Kremlin has said. "Russian-U.S. relations have reached a very high level, which is proved by the serious results of joint work in various spheres," a statement issued by the Russian presidential administration said. "Besides signing and ratifying a new strategic arms reduction treaty, the counties managed to conclude bilateral negotiations on Russia's accession to the World Trade Organization (WTO) and launch a perspective cooperation in the hi-tech and innovation sphere; an agreement on cooperation in the peaceful use of nuclear energy has also come into force," the statement said. Gates, who arrived in Russia on March 21 and delivered a speech at a naval academy in St. Petersburg, will also hold talks with his Russian counterpart Anatoly Serdyukov on Tuesday. 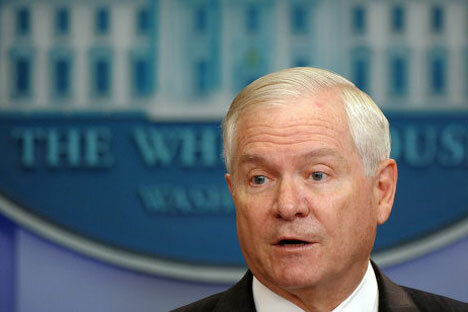 The visit is Gates' final trip to Russia as Pentagon chief as he is to retire in 2011, before the 2012 election campaign begins. Missile defense is expected to become a major issue of discussion during the talks. "Russia is ready to tackle the common tasks aimed at protecting the continent from possible missile threats together with its partners while sticking to a range of principal conditions, including the existence of real guarantees that the countries' anti-missile potentials will not be aimed at each other, as well as guarantees of equality and indivisibility of security," the Kremlin said. Russia and NATO agreed to cooperate on the so called Euro missile defense system during the Russia-NATO Council summit in Lisbon in November 2010. NATO insists there should be two independent systems that exchange information, while Russia favors a joint system.